Michael Bociurkiw #OSCE expert update call from #MH17 crash site. Access severely restricted, movements controlled. Audio: We have just shot down a plane. He use to be high ranking officer in Soviet Army and knows well how Russian army works. In a longer Estonian version he says that if Russian officers are ordered to shoot down a plane, they will do it, no questions asked. RFERL Fact Sheet. Who had the missiles. Tweets claiming credit for shooting down a Ukrainian plane. Another Russia Today reporter resigns. 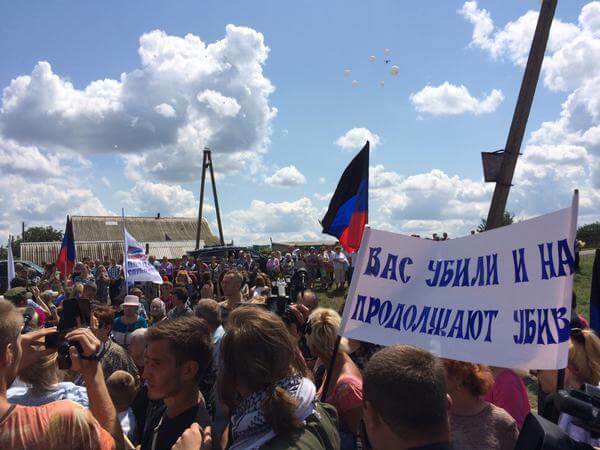 This time in protest at MH17 coverage. June 29, 2014: ITAR TASS Reports: Separatists gained control of the Buk Anti-Aircraft Missle System. July 17, 2014: ITAR TASS Reports: Separatists never had the Buk Anti-Aircraft Missile System. As fingers point at Malaysia Airlines for allowing flight MH17 to fly over a war zone, a German weekly news magazine has revealed that Singapore Airlines jets flew over the same eastern Ukraine area 75 times in the past week. In contrast, MAS planes only flew over rebel-held Donetsk 48 times within the same period, Spiegel Online reported, citing flight tracking website flightradar24.com. It said Russian airline Aeroflot flew over the area 86 times in the past seven days, Ukraine International Airlines 62 times, and Germany’s largest airline, Lufthansa, 56 times. “Overflights were recorded here in the past seven days in a radius of nearly 240km to the Ukrainian industrial city. “In the ranking of the airlines, MAS is at fifth place with 48 overflights… the data shows that the region of Donetsk experienced brisk air traffic,” said Spiegel Online. 1.On morning of June 17, pro-Russian terrorists boast that they have captured ground-to-air missile system “Buk” and show the pictures. 2. Terrorists shot down a plane and say that this is Ukrainian military transport aircraft AN-26. 3. All YouTube and pro-Russian FB and Twitter communities celebrate this fact and distribute video of the burning plane. 4. Ten minutes later, there are reports that the downed aircraft is the passenger airliner Boing which belongs to Malaysia Airlines Flight MH17 with 295 people on board. Deleted DPR tweet about possessing BUK. It seems like one of the Separatist leaders, Girkin — a Russian GRU (military intelligence / subversion) officer with experience in Chechnya, momentarily claimed credit for shooting down a Ukrainian plane before realizing it was a passenger plane. Note: some people are saying this VK page is not managed by Girkin, but by some Russian group who supports him. Russian television reports rebels shot down Ukrainian military plane, then the same anchor woman claims the incident was the Ukrainian military shooting down MH17. Cynical lies. Russian television airs photos of wreckage showing explosion damage, not gun damage, contradicting their propaganda. The fake Russian satellite imagery of MH17. The attack was the Ukrainian government trying to make it look like an attack by pro-Russian rebels. Air traffic control in Kiev, where he claimed to work, was being taken over by the Ukrainian miliary, with phones and other equipment being confiscated from staff. 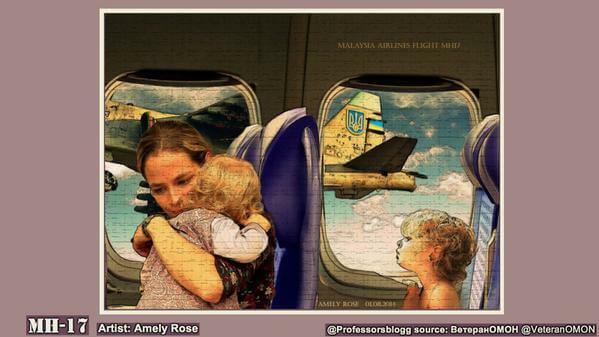 That MH17 was being escorted by two Ukrainian jet fighters minutes before MH17 was shot down. That it was shot down by a missile, with the military present with Carlos confirming it was Ukrainian. This is not the first time we have been asked about him. This “Carlos” was also active during the Maidán revolution in Ukraine. We have no knowledge of “Carlos” having been in Ukraine. Russia’s propaganda isn’t even internally consistent. Not all of their theories can be true. One of Russia’s many claims was that a Ukrainian SU-25 shot down MH17 — this is technically impossible for several reasons. Its ceiling is too low and its maximum speed is slower that cruising Boeing 777. News Corp Australia report that over 20 minutes of unreleased footage exists of Russian-backed militants ransacking luggage in the immediate aftermath. One senior figure from the Donetsk militants has already been identified on the recording, claims News Corp. The Dutch team have had access to satellite images, radar information and the plane’s flight data recorder, but were blocked from entering the crash site by the militants in the days following the disaster. Dutch investigators believe the Russian soldiers who shot down MH17 may have been killed. One of the individuals who may have been involved in the downing of flight MH17 according to the Dutch Public Prosecution Service (OM), was recognized by Ukraine as a former high ranking Russian intelligence officer. It is the first indication that the Dutch Prosecution Service is considering the involvement of high ranking Russian (former) servicemen. On Monday, the Public Prosecution Service published four tapped telephone conversations from the period surrounding the crash. The service did not reveal the callers’ identities, but explained that the conversations featured “separatists”. On Monday, chief prosecutor Fred Westerbeke spoke of “authentic recordings” that “were analyzed through and through”. 60 Minutes Investigation: MH17 was downed by Russian BUK. – Satellite images presented by the Russian Ministry of Defence claiming to shown Ukrainian Buks linked to the downing of MH17 on July 14th and 17th are in fact older images from June 2014. – The discrepancies visible in the Russian MoD satellite map imagery which shows they are incorrectly dated are visible in publicly available imagery on Google Earth. – Error level analysis of the images also reveal the images have been edited. – This includes a Buk missile launcher that was removed to make it appear the Buk missile launcher was active on July 17th, and imagery where Buk missile launchers were added to make it appear they were within attack range of Flight MH17. – The flight path was not altered in the way claimed by the Russian Ministry of Defence. Data from the Dutch Safety Board’s preliminary report and other sources show Flight MH17 made no major course changes such as the one described in the Russian Ministry of Defence press conference. – The Russian Ministry of Defence claimed the video of the Buk missile launcher presented by the Ukrainian Ministry of Interior was filmed in the Ukrainian government control town of Krasnoarmeisk. This has been proven to be untrue, with analysis of the video showing it was filmed in the separatists controlled city of Luhansk. – Radar imagery was described as showing an aircraft close to Flight MH17 after it was shot down. Experts interviewed by various media organisations have stated this is almost certainly debris from Flight MH17 as it broke up over Eastern Ukraine. – Satellite imagery shows Ukrainian Buk activity around July 17th. As this report shows, those claims are untrue, and were based on fabricated satellite imagery. More revealing, the Russian media, including ITAR-TASS, RIA Novosti, and Vzglyad.ru, cited this forum and other sources that claimed the separatists had shot down a Ukrainian cargo plane—until, of course, it was learned that the crashed plane was a civilian airliner. “Ukrainian military claim that the losses were caused by actions by Russia. The militia refuted this information, correcting that they had shot down the plane from a ZRK ‘9K37M1’ (better known as a Buk).” . . .
“People from the east (of Ukraine) said that they had shot down a military plane. If they believed that they had shot down a military plane, it was confusion. If it was confusion, then it was not an act of terrorism.” In other words, a high-ranking Russian diplomat was trying to account for why separatists shot down MH17—a disclosure that, as we shall see, was ignored and then vehemently rejected by Churkin’s superiors. . . .
News Corp also says that their investigation has unearthed evidence that the locals on the ground were being instructed to say that a Ukrainian jet shot down the civilian airliner. The video is disturbing. Russian-backed fighters rummage through the luggage of the recently deceased in search for the aircraft’s black boxes and other identifiable paperwork and USB sticks. The commander continues to repeat that “they [the Ukrainians] brought down the passenger plane [with a fighter jet] and we brought down the fighter.” The problem—there is no fighter. This commander’s troops have just shot down a civilian aircraft, a fact that begins to dawn on them over the course of the 17-minute video. Kremlin tabloid releases badly impersonated CIA agents discussing MH 17. Pro-Russian separatist leaders in the eastern Ukrainian region of Luhansk have blocked access to Dutch law enforcement officials pursuing an investigation into the downing of a Malaysian jetliner nearly a year ago, the Netherlands Public Prosecution Office said on Saturday. The obstruction by separatist officials prompted the investigators, from the Dutch National Police and Ministry of Defense, to cut short their field work in Ukraine without conducting research into cellphone towers and cellular networks in the region, the public prosecution office said. The passenger jet, Malaysia Airlines Flight 17, was shot down on July 17 as it flew over the war zone in eastern Ukraine during a journey from Amsterdam to Kuala Lumpur, killing all 298 people on board, including 196 Dutch citizens. Here it is, though it’s been completely obvious from the beginning to anyone paying close attention. The Russians CLAIMED CREDIT for shooting down the aircraft, and then quickly changed their story after discovering it was a civilian plane. They’ve offered at least a half dozen contradictory explanations and theories. One of the more prominent of their many contradictory stories and explanations was that a Ukrainian fighter shot down MH17. According to Russian GRU Officer Igor Girkin, MH-17 was loaded with corpses and crashed to discredit the Russian side of the war. A seemingly invented persona, a visiting air traffic controller named “Carlos,” claimed Air traffic controllers in Kiev, intentionally redirected MH-17 over a dangerous area. “Carlos,” who does not seem to ever have existed, also tweeted that MH-17 was attacked by the Ukrainian government trying to make it look like an attack by pro-Russian rebels, and that MH-17 was being escorted by two Ukrainian jet fighters minutes before MH-17 was shot down. The Kremlin released satellite imagines “proving” MH-17 was shot down by a Ukrainian SU-25. The images even captured the air-to-air missile mid-flight! CBC’s interview with Michael Bociurkiw of the notoriously Russian-influence OSCE claimed the damage “almost looks like machine gun fire, very very strong machine gun fire” sparking speculation that this damage was caused by a GSh-30-2 30mm cannon, one of the SU-25’s armaments. Most recently, after numerous investigations concluded that MH-17 was shot down by a BUK surface-to-air missle, Russian media returned to claiming it was brought down by a Ukrainian BUK. Story about how Ukrainians though Putin was on board. This entry was posted in News & Views on July 19, 2014 by RomanInUkraine.